Everyone deserves to be appreciated when he or she put serious efforts into achieving something. Most of the companies use the certificate of appreciation to appreciate their employees. The purpose of awarding this certificate is to show the gratitude towards the employee who has put serious efforts into achieving something. Whether you want to say thanks to someone for completing the project, or to recognize the efforts of someone, the use of certificate of appreciation is always the best choice. The certificate of appreciation template provides you thousands of designs to incorporate in the certificate. No matter you want to appreciate the employee for achieving the goal or for completing a project, the template provides the best designs for every situation. Giving the certificate of appreciation is considered as best way to show the people that you value them. Being appreciated is one of the best feelings of the world. Appreciation of the employee is very beneficial for the organization also as it enhances the confidence of the employee and he aims to perform better to be appreciated in future also. Using the template for a certificate of appreciation is very beneficial because it allows the user to edit it in no time. 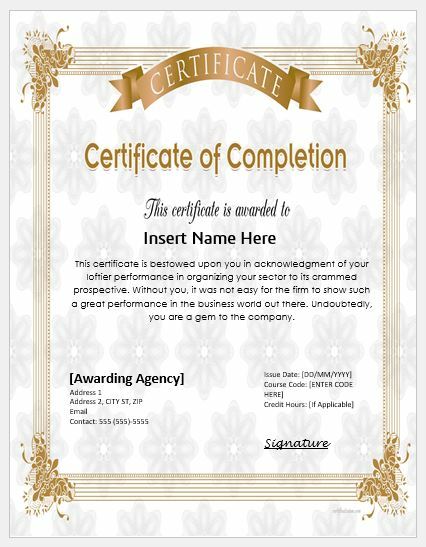 All you must do is add the name of the person receiving this certificate, the reason for appreciation and your details including signatures and stamp that authenticates the certificate. There are also many ways by which you can edit this template. For example, if you don’t like the background of the template or you want to give the background of your choice to the certificate, you can change it through the customization feature. If you want to upload your own picture or the picture of the recipient in the template, you can add it easily. The certificate which is customized according to the needs of the company is totally relevant to the recipient. This gives the feeling to the recipient that serious efforts have been put to value him by awarding a certificate of appreciation. You can follow few steps to create the certificate having different statements/wording on it. 2. Open it using MS Word and select the text that you want to change. 3. Copy the text of your choice that is given below and pastes into the certificate. This certificate is conferred on you as an appreciation for your hard work & composure. The company wants to thank you for your amazing services & commitment with your work which stands for exact professionalism. You have always shown a very affirmative attitude & acceptance in every matter which makes it easier to be followed by others. This certificate is bestowed upon you in acknowledgment of your loftier performance in organizing your sector to its crammed prospective. Without you, it was not easy for the firm to show such a great performance in the business world out there. Undoubtedly, you are a gem to the company. This certificate is given to you in recognition for volunteering your energies & time in the best possible way. You never laid back whenever it came to the name of the firm. You always gave your 100% in every respect. We highly endorse this act of positivity & constructiveness which is an example. Thank you! The way you participated in the completion of this project is mind-blowing. The accomplishment of the venture on appointed time wasn’t an easy task anyway if you were not there to play your part in the best probable manner. This certificate is conferred upon you to appreciate your selfless efforts for an earnest cause. It is highly admirable that you want to share your experience with all other members working in our firm. The company endorses all your efforts & great intentions. Baseball certificates Awarding Baseball certificates is a traditional way to reward the baseball players. Kate Elizabeth is fond of writing and sharing quality literature with her fellows. She has been writing since high school and has decided now to publish her ideas on the web worldwide. She write about different ideas that help in solving daily life problems. It includes from office documentation to household chore activities.